Seattle Solidarity Network's campaign of direct action finally convinced thieving boss Eric Galanti to pay Lucio his long-withheld wages. Seattle Solidarity Network's campaign of direct action finally convinced thieving boss Eric Galanti to pay Lucio his long-withheld wages. Lucio was a cook at the Admiral Pub in West Seattle; when Lucio was deported to Mexico, Galanti took advantage of the situation by withholding Lucio's final paycheck. But with the support of Lucio's family here in Seattle, Seasol fought for the payment of Lucio's wages. In late August, Seasol member Luis told us his uncle Lucio had been detained by ICE and was facing deportation to Mexico. Adding to Lucio's problems, his boss Eric Galanti had refused to pay him his final paycheck. Not only was the paycheck theft unjust; now Lucio was faced with arriving in Tijuana without money for food or transportation back to his hometown. Soon, Lucio was indeed deported to Mexico. Friends helped him with money for the trip, while Luis and other Seasol members went to work on the long fight to get Lucio his stolen wages. 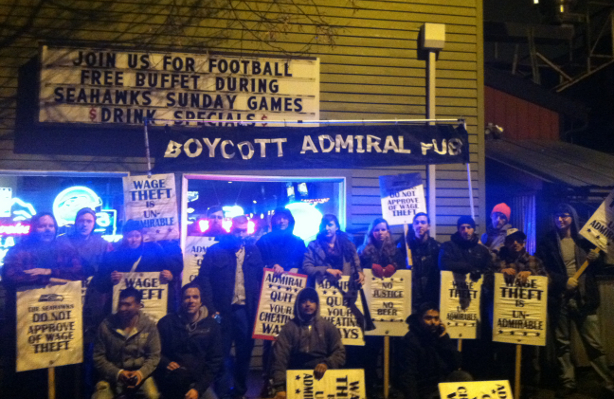 On September 19, 2012, thirty or so Seasol members and supporters walked into Admiral Pub in West Seattle. Seasol delivered a letter demanding that Galanti pay Lucio his unjustly withheld wages within the next two weeks. Galanti didn't pay, and Seasol went into action, getting the word out, letting Seattle know about Lucio's unfair treatment. Months of pickets at Admiral Pub followed. In January, Seasol and Luis brought the fight to another bar Galanti owns, Bourbon Jack's in Kent. It wasn't Galanti the proud and stubborn boss who sat down with Seasol members and a member of Lucio's family at a Taco Bell in Kent on a Friday night, to negotiate a surrender. Instead, here was a man whose two bars had seen four vuvuzela-tooting, sign-waving, chants-chanting, flyers-handing-out, revenue-draining pickets in just the past three weeks. That night Galanti gave in. For months he'd denied and haggled and moaned and lied, but in the end he wrote a check to one of Lucio's relatives for the money Lucio had earned. Lucio was a cook at the Admiral Pub in West Seattle; when Lucio was deported to Mexico, his boss took advantage of the situation by withholding Lucio's final paycheck. But with the support of Lucio's family here in Seattle, Seasol fought for the payment of Lucio's wages.